Standard - $39.99 Teen - $39.99 X-Large - $39.99 Only 8 left! The League of Shadows is recruiting. Oh, and look, you just happened to wash up on their scary little island of terrors. But they are not the helpful force you think they are. You have made the same mistake as Bruce Wayne, you trusted the League of Shadows. Now you are back home. But home isn't really home any more, is it? Nothing can be the same after the time you spent with the League. Nothing can ever be the same when you see the secret under workings of the city you love. The evil that resides there. The League gave you the skills to do something about it. You need to do something to save your city. You need to become a hero. But you can't let anyone know who you really are. You need a secret identity. 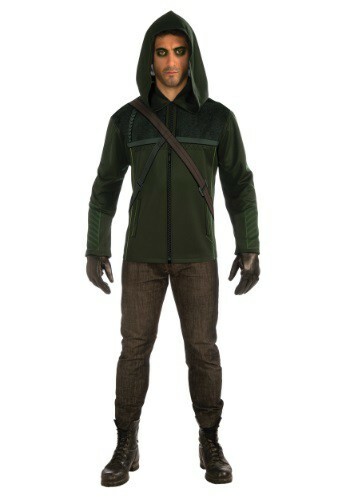 Well, now that Oliver Queen has a new leathery suit, he has donated all of his original Arrow suits to us! He asked that we pass them along to any would be super hero out there. When you put on this Adult Arrow Costume you take on the responsibility of saving your city. You are responsible for keeping your secret identity secret. You don't want any bad guys to know who you really are. They would come for your family, and friends. But you might want to find some vigilante friends to help you out, because the League never forgets. And you owe them. Stay safe, and may your arrows fly true.